Refined sterling silver ring Oregon sunstone. The cabochon cut sunstone is only found in Oregon. The mix and match ring is especially made for NJAmsterdam by our silversmith on Bali. You can beautifully combine the sunstone women's ring with our stackable rings or wear it alone. You receive your ring in a jewelry gift box. The size of the peach orange gemstone ring is 5 x 6 mm. This Oregon sunstone ring is only found in Oregon USA and is family of the labradorite. Don’t soak gemstone jewelry in water but wipe them clean with a soft cloth without chemicals. Sterling silver ring with sparkling faceted smokey quartz. 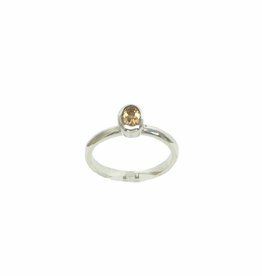 Sterling silver (925) stackable ring with faceted citrine. Sterling silver gemstone ring with facetted oval light yellow citrine.